Yesterday (November 4th) was Election Day in the US. 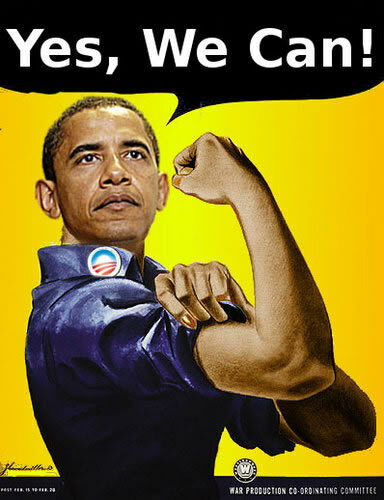 It ended in a big victory for the Republicans, with a matching defeat for the Democrats and President Obama. It will be much more difficult for the President to push an agenda that he believes in through a Republican dominated Congress, and legislation to mitigate climate change will probably be a major casualty. The bright side of this is that the American democracy is solid enough that in two years the prevailing voices might change, and within the time span of climate change, two years is not a long time. 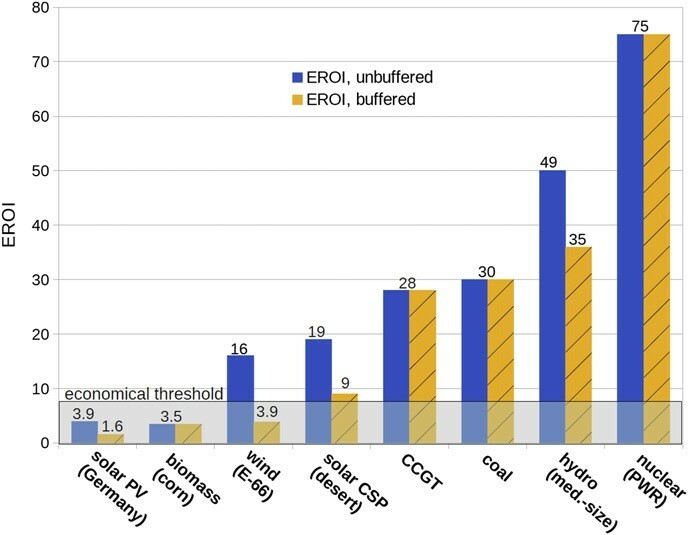 The problem is analysed in an important paper by Weißbach et al.1 in terms of energy returned on energy invested, or EROI (sometimes EROEI) – the ratio of the energy produced over the life of a power plant to the energy that was required to build it. It takes energy to make a power plant – to manufacture its components, mine the fuel, and so on. The power plant needs to make at least this much energy to break even. A break-even power plant has an EROI of 1. But such a plant would pointless, as there is no energy surplus to do the useful things we use energy for. Anybody with a similar educational background to myself and Dr. Morgan (both of us have PhDs in Physical Chemistry as well as experience in energy research) sees a graph such as the one shown above as a likely consequence of the 2nd law of thermodynamics, since it features a threshold which you are not allowed to cross (see Adrian Cho’s comment on inequality in economics regarding my September 2, 2014 blog, and my October 8, 2013 blog on desalination). If you grow up in science, you know that you physically can’t defy the 2nd law of thermodynamics. That’s the law that is responsible for the 30% efficiency rate for generating electricity from fossil fuels, and it mandates the energy threshold necessary for desalinating water (October 8, 2013 blog). If we are forbidden from crossing the threshold, however, we are left with only hydroelectric and nuclear means to replace fossil fuels or to capture the emissions from fossil fuel-powered devices (CCS – Capturing Carbon Dioxide and Sequestration). CCS drastically changes the economy and the EROI. As shown by Fig. 2 above, the IPCC recently published a typical energy scenario needed to achieve a stable atmosphere and a climate system that is not dominated by human activities. Basically, toward the end of the century, the only surviving fossil fuel without CCS will be natural gas. The rest of the slack would have to be picked up by nuclear energy and all the sustainable sources whose energy production the EROI argument claims are unachievable on such a scale. This attitude fits perfectly with one of the shades of deniers that I have previously described – the skeptics (September 3, 2012 blog) and requires a detailed response that will follow in this and the next few blogs. EROI has been very useful (and controversial) in the past in analyzing energy options to replace fossil fuels. The specific system that was the focus was using alcohol (ethanol) generated from corn as compared with the Brazilian use of sugar cane as the source. I will elaborate on this in my next blog. Here I will only mention that the argument focused on the fact that to make the ethanol we use energy that is largely generated from fossil fuels so if the EROI is too small we don’t replace (much less surpass) that expended from the fossil fuels. It would have been a different case if instead we were to grow the corn and use the product of the fermentation as our sole energy source to produce the alcohol. We obviously couldn’t have done it with an EROI smaller than 1; the break-even (EROI = 1) assures that there is enough energy supply to run the process and whatever is left afterwards will be available for other uses. The emphasis on what you cannot do is problematic unless anchored on very strong arguments consistent with the science. In the place where I grew up, people are nice to their guests; I will not attack Dr. Morgan’s guest blog, but I do feel free to criticize the underlying paper on which his blog is based. The title of the threshold is the “Economic Threshold.” But it is also written that the EROI considerations are independent of economic considerations, meaning that the argument must be completely basic and fundamental – to me that says it must be as fundamental as the 2nd law. So let us go to the original paper: “Energy intensities, EROIs (energy returned on invested), and energy payback times of electricity generating power plants”; D. Weißbach a,b,*, G. Ruprecht a, A. Huke a,c, K. Czerski a,b, S. Gottlieb a, A. Hussein a,d; Energy 52 (2013) 210e221 ). Since the “investor’s view” has been used whenever possible there should be a simple relation to the economy. In fact, the EMROIRem as defined in Sec. 2.5, is supposed to describe the economic relation better, even though it depends not only on the kind of the power plant but also on the surrounding market. Rem is used by many authors as “EROI”, but in fact it is somewhere in the middle of the physical EROI and the actual cost ratio as it still ignores human labor costs. Energetically, human labor is negligible but financially, it dominates and represents the welfare of the society or of the sub-society working in this energy sector. For the returned energy ER, the money to energy ratio is simply given by the usual market price. For the invested energy EI, however, the ratio is much larger since it contains all the surplus of the value-added chain. Therefore, an EROI threshold can be roughly estimated by the ratio of the GDP to the unweighted final energy consumption while an EMROI threshold can be estimated by the weighted final energy consumption (which is not the primary energy consumption). For the U.S., for instance, the GDP was $15 trillion in 2011 while the unweighted end energy consumption was about 20 trillion kWh, resulting in an “energy value” of some 70 cent/kWh (Germany w135 cent/kWh). The average electricity price, however, is 10 cent/kWh , (Germany w18 cent/kWh) so there is a factor of 7 higher money to energy ratio on the input side. The same calculation for the weighted final energy consumption (the electricity demand was multiplied by a factor of about 3) results in a ratio of about 16 for both countries, assuming average primary energy costs of 5 cent/kWh and 3.5 cent/kWh for Germany and the USA, respectively. A similar ratio can be seen for other countries which leads to the conclusion that the thresholds are 7 and 16 for the EROI and the EMROI, respectively, assuming OECD-like energy consuming technology. For lower developed countries thresholds might be smaller, thus making also “simple” energies like biomass economic. Of course, the cost structure for different power plants is quite different. For construction and maintenance of a nuclear power plant there are a lot of non-energetic costs, dominated by prolonged licensing procedures and highly-qualified personnel costs that can not be “outsourced”, contrary to solar cell production which profits from cheap manpower for manufacturing, e.g. in China. Besides ethical complications the monetary ratio can fluctuate anyway due to changing safety policies, international trading agreements and politically motivated subsidies. In summary, one has to consider both the EROI and the technical grade of energy consuming infrastructure (non-technical issues are ignored for simplicity here) to assess the society’s prosperity. In other words, the threshold is not computed through physics; it is based on economics and what we are willing to do. What a relief! Next week I’ll analyze the Weißbach paper in a bit more detail and will try to show that Yes We Can save the planet for our children by changing the energy sources that we currently use. This entry was posted in Climate Change and tagged Adaptation, CCS, Clean Energy, Climate Change, Climate Change Denial, Climate Change Deniers, Climate Skeptics, democracy, Democrats, Desalination, DNNer, Economics, Efficiency, Election, electrical power, Electricity, Energy, EROI, ethanol, Fatalists, Fossil Fuels, Global Warming, IPCC, John Morgan, Mitigation, Natural Gas, Nuclear, Nuclear Energy, Obama, Physics, Power Plants, Renewable, Republicans, Science, senate, Sequestration, Sustainability, Technology, Thermodynamics, threshold. Bookmark the permalink. I went to the Climate Change March in New York City on September 21th 2014 and I’ve to admit it, it was the best and most incredible March I’ve ever been to in my whole life. What surprised me the most was the number of people of all ages that came out with the enormous amount of energy that they had. Every single person that came out that day showed how really they care about the Earth and the environment. They all wanted to see a change, they wanted to make a difference, together they wanted to build a better tomorrow. I was truly amazed and emotional somehow seeing so many veterans and even handicaps walking miles and miles just because they care and want to make the world a better place. The March wasn’t just about climate change, but also about how the Founding Fathers wanted this country to be, a land of freedom and opportunity and for that reason they were also people who had a small center stage singing and rapping about immigration and how they wish they could have a better immigration system in the United States. All in all, I was exhausted, but I played soccer, I recycled and I had poster so did many other people who came to the March. Hi. My take on Dr Morgan’s position after many conversations with him, is that we need to act NOW. This is very far from the “skeptics'” position in your Sept 2012 blog you link to. You present the skeptical position there as being that we should delay action because future generations will be richer. John’s position is the opposite. We need to act now. And we need to act in a way that minimises the impact on the richness of our way of life. Any adverse impacts on our way of life will not be accepted by present generations. To do that well, renewables can’t carry the load (at least according to the calculations John presents). So you need an alternative. And the only alternative is nuclear. So, John is pushing for dramatic action now to combat climate change. Hardly a skeptical position. I find it very surprising that you link Dr Morgan’s arguments with those of the “skeptics” in your post of Sept 3 2012. You seem to be equating Dr Morgan with the position of “do nothing now” – the “Lomborg” view in your post. This is far from the Dr Morgan’s position, as I understand it from many conversations with him. John is rather saying that we must get dramatic change now. But that the only way this will happen is to minimise the “switching cost”, as it were. That is, to minimse the impact on how we live now. Because any approach that requires radical reduction in standards of living will never be accepted – human nature being what it is. John’s article is attempting to show that to run a complex civilisation like our’s, you need a lot of energy – and renewables don’t cut it. Therefore, the only solution you’re left with is nuclear. Far from denying the urgency of the problem – he is advocating drastic action, now. A position very far from the one you attribute to people like Lomborg. I know that John Morgan would not disagree with that statement. I suspect the disagreement is around what the energy sources need to be. I suspect that you see them as largely renewable energy which indeed requires substantial energy storage so any challenge to the economics of this is met with some scorn. I agree with Steve and I’m looking forward to your analysis of Weißbach et al. Very, very odd to position John Morgan with climate deniers, however tangentially. I suggest you entertain the possibility that it’s not just an “attitude” of “deniers”, it’s a considered position held by a lot of thinking, caring people who are genuinely troubled by the insistence on pursuing 100 % renewable visions seemingly for their own sake. Here’s John Morgan expressingly, most eloquently, his concern about climate change at the awful trade-off he sees taking place through the constraint of nuclear energy. This post read like smear, leveraged as an excuse to undermine a position. If you are going to venture a critique, make it impartial. John Morgan does not deserve to be written-off in any way. I’m looking forward to your analysis of Weißbach et al. Please be aware that in the supporting documents are the spreadsheets containing every parameter and assumption used in the Weißach calculations (a transparency that all authors should provide). It’s very peculiar that you would group Dr. Morgan with climate skeptics. I recommend that you read his publications as you will quickly learn how much thoughtful and innovative work he has done towards accelerating decarbonization. It’s hard to think of any individual who has done more towards devising effective energy policies. Its pretty hard for someone who gives a damn about our ecological endowment, urges the strongest possible responses to climate change, and spends a lot of time thinking and writing about how to most rapidly decarbonise our civilization, to find oneself lumped in with the climate deniers and skeptics. Why would you do this? I’m baffled. Nothing in my post is written from that perspective, not least because its a perspective that offends me. Of course one should be nice to guests, particularly invited guests, but here it seems to require of you some particular forbearance. Again, I’m baffled. I think it would be a good idea if you updated this post and any future discussion to make it abundantly clear that I am very much not a climate skeptic; I regard myself as a climate hawk, others have called me a deep green. Criticize both my post and the underlying references by all means. I don’t mind being wrong. I do mind being smeared.